My husband suffers from an extreme case of Athlete’s Foot. If you’re anything like my stubborn strong-willed husband, you use a new cream or spray for a few days (until someone stops reminding you) but not long enough to have any lasting effect. Then, you’re back to using the carpet on the stairs or in front of your favorite chair as your “scratching post”. My latest discovery is that he stretches a sock, one end in each hand, to scratch between his toes, leaving the sock twice the length that it was to begin with. A few weeks ago, my toes started to itch. So, we’re trying something new and getting rid of this stuff! No more expensive creams and sprays that sit, forgotten, in the medicine cabinet until they expire. We’re trying a home-remedy. Vinegar is my fallback for everything. You can find websites that list hundreds of uses for vinegar. I buy white vinegar at Walmart in the biggest jug they have for less than $3, and I use it for everything. I remember my dad sometimes adding vinegar to a foot soak to soften dry skin. So, I thought, why not? If it softens skin, it has to help with the dry skin caused by Athlete’s Foot. 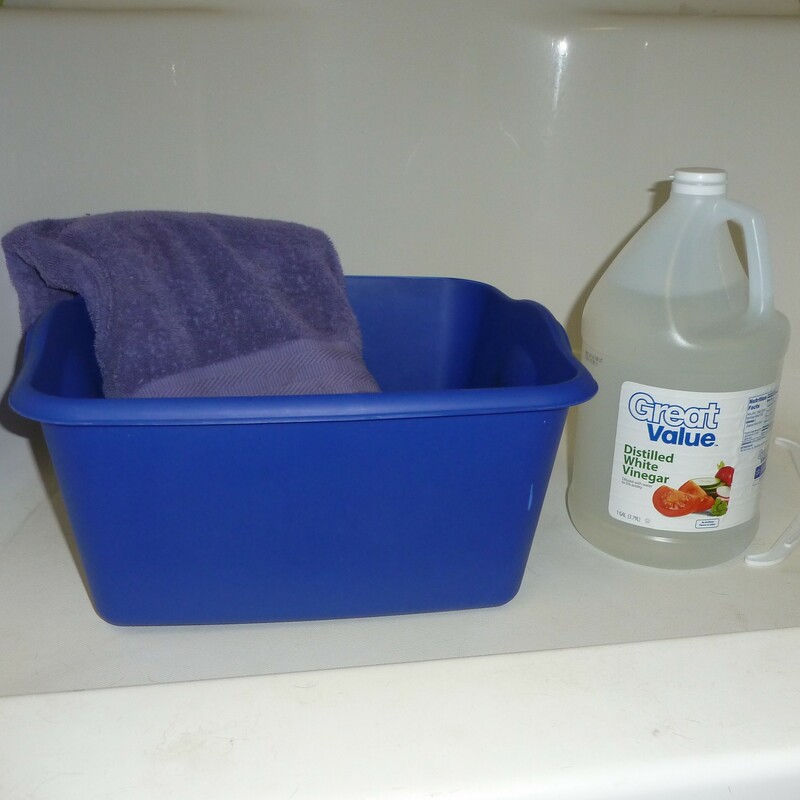 Add enough vinegar to a dish tub or large rectangle container to fill it 1-inch. Add hot water to cover your feet. After soaking, scrub off any dead skin with a pumice stone or an old towel. Note: I’ve used both apple cider vinegar and white vinegar to soak my feet. For the Athlete’s Feet treatment we’re using white vinegar, because it seems to be more common in “cleaning/disinfecting” recipes. I love vinegar — good for so many things. This is a great idea! This is a great idea!! I will have to try this for sure – thanks for sharing it! Maybe we can finally get rid of that pesky athlete’s foot!! New follower from the Mommy Mingle hop!! I have been reading your posts, one after another, and it is very encouraging to see the real sweetness you have toward your husband. May his heart be strengthened in his walk with the Lord or may he find Jesus through your quiet testimony. Praise God you have a vision for being that gentle, humble helpmeet. Ahead of time I wish to thank you for always sharing your deifying blog, friend. Thank you! This comment means so much to me!